Sales of industrial robots in India reached a new record of 3,412 new units installed in 2017. That is an increase of 30 percent compared to the previous year (2016: 2,627 units). Between 2012 and 2017 India saw a compound annual sales growth rate (CAGR) of 18 percent. 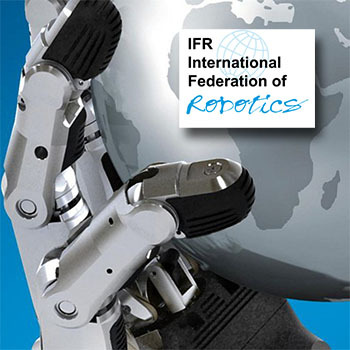 These are the initial findings of the World Robotics Report 2018, published by the International Federation of Robotics (IFR). Broken down by industry, India´s automotive sector is the main end user with a share of 62 percent of the total supply in 2017. Sales rose by 27 percent compared to the previous year. 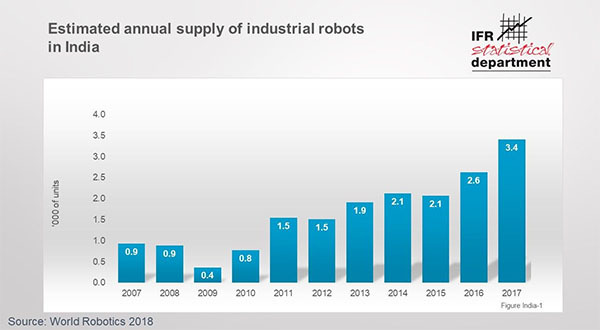 A clear sign that the general industry is catching up with the automotive sector can be seen by the sales numbers of industrial robots in e.g. the plastics and rubber industry, the metal industry and the electrical and electronics industry, which increased by 46 percent in 2017. India´s automation potential is best illustrated by it’s rather low robot density figure: 85 industrial robots per 10,000 employees in the automotive industry is less than a quarter of that in Indonesia (378 units) and far away from China (505 units).